This unique walking experience is ideal for guests looking for an adventurous and authentic option offering the ambience of a tented bush camp of old Safari lore. The camp is located on a plateau set amongst the only basalt and granite extrusions on Shamwari. 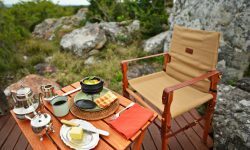 This is a flexible experience for guests to explore Shamwari Game Reserve as we believe that the rigidity of travel needs to be simplified by going back to basics. This explorer camp reflects the original safari of being on foot and sleeping around the fire at night within the comfort of a bush tent. There are 3 Mobile Canvas tents sleeping 2 guests each, there is 1 outside shower shared by all guests and 1 flush toilet shared by all guests. The tents are furnished with aluminum stretcher beds with duvets and pillows with LED lights, outside basin ( warm water is provided), a hammock. This experience is a the true African bush adventure.